I was sad to see Marabella Meatball Co shutter on Walnut Street. I really enjoyed their meatballs, sauces, high quality cheeses, and BYO policy. 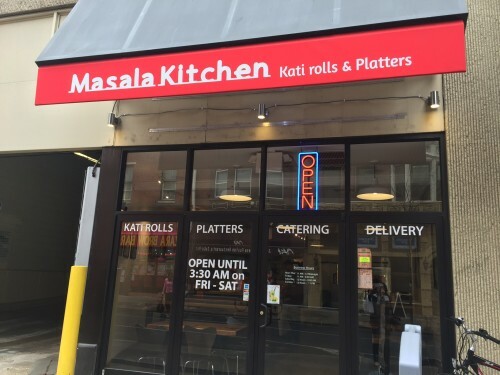 But the folks from Spice End took over the spot and set up Masala Kitchen with a small menu of kati rolls and rice plates. I love kati rolls and have yet to find the perfect one in Philly. I ordered a beef tikka roll to go and ate it on the run, which wasn’t the best plan. I was hoping there would have been some recipe improvement from the time I ordered similarly at Spice End. 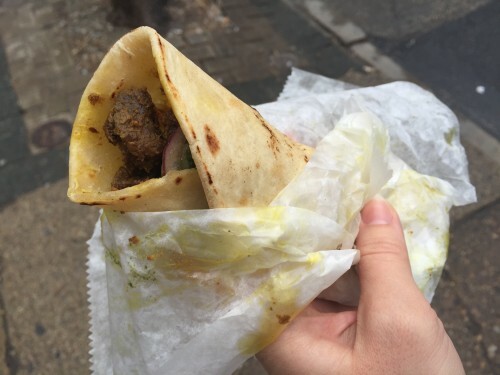 The wrap got a little drippy and some the the pieces of beef were gristly- I needed to locate a garbage to toss my half chewed pieces…. cute image, right? At $5.50 for the one roll, this isn’t the biggest bang for your buck. I would have loved some sort of side dish- pickles maybe? Don’t forget to grab some zesty white sauce with whatever you end up ordering. Posted by Jamie at 12:45 pm, April 6th, 2016 under Uncategorized.